From left: Auburn University students Joshua Henderson, Chandler Johnson, Tyler Easterwood and Madeline Frazier; Codi Plaster, student advisor; Dr. Donald Conner, department head; and Bill Ingram, Ingram Farms, past USPOULTRY chairman. 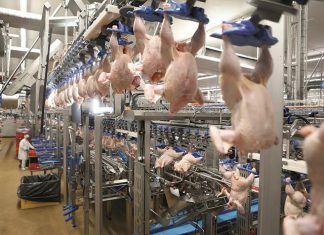 Auburn University is one of six universities in the United States that has a department dedicated to poultry science. 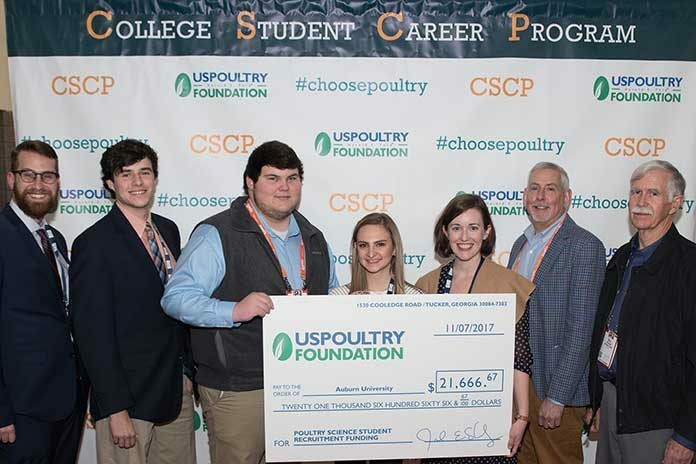 The USPOULTRY Foundation awarded a $21,667 student recruiting grant to Auburn University. The grant was made possible in part from an endowing Foundation gift from Ingram Farms. Dr. Donald Conner, department head, explained how the grant will positively impact their ability to recruit future poultry science students. 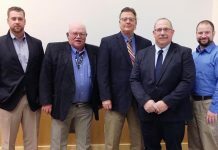 “The Auburn Department of Poultry Science is extremely appreciative of the funds provided by the USPOULTRY Foundation. This grant enables us to promote poultry science to a broad group of potential students throughout the state, while serving to increase our enrollment. 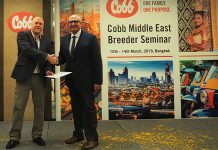 We strive to recruit strong students and provide them with an outstanding learning experience, so they will enter the poultry industry prepared to hit the ground running and make an impact in the long-term,” said Dr. Connor. The USPOULTRY Foundation awarded recruiting grants totalling $282,500 for the 2017-18 school year to 35 colleges and universities across the United States with either a poultry science department or a poultry studies program. The student recruiting program dates back to 1994 when the USPOULTRY board of directors established the Foundation to provide annual recruiting funds to attract students to poultry studies and ultimately into careers in the poultry industry. The recruiting grant check presentations were part of College Student Career Program activities at the 2018 International Poultry Expo, part of the International Production & Processing Expo.